110/365(+1), a photo by Luca Rossini on Flickr. We did it. We moved in. All the boxes were emptied, all the shelves were filled, all the rooms were cleaned. After a whole day of (hard) work, we opened a bottle of champagne with my parents and sister and then we had dinner at the great little place which is just in front of our new flat. The place is called Osteria Fernanda, and if any of you readers come to visit us we’ll enjoy it’s amazing food together. 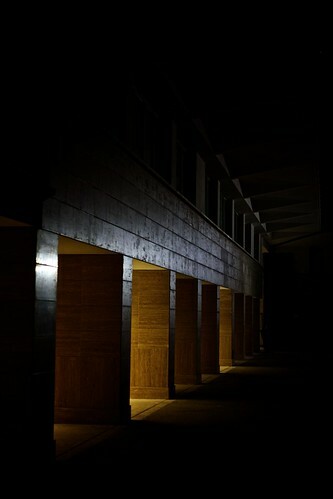 Coming back from the restaurant I took a shot of the entrance hall of our building. Now I’m just exhausted. And I’m willing to experience the first time sleeping at the new place. That restaurant looks very interesting inside with the exposed brick! I'd love to come back to Rome, hopefully one day my lady and I can meet up with you and yours for a meal there! An added note, looks like on the Fernanda side of the road the graffiti is pretty big, at least on the google street view. The Osteria Fernanda website has a much nicer picture of the front of the restaurant!